English Cocker Spaniels are members of the Sporting Group. They were originally designed as a hunting companion for flushing and retrieving game. English Cocker Spaniels can still be used for hunting purposes provided a dog is chosen with the proper structure and temperament. Most English Cocker Spaniels, however, are companion animals. They are friendly, gentle, obedient and adaptable. In the 1800’s, small spaniels were developed to hunt woodcock. The sizes of puppies from these early litters varied widely. The first stud book of the Kennel Club (United Kingdom) divided the dogs by weight alone. If a spaniel weighed under 25 lbs, it was called a Cocker Spaniel. If a spaniel weighed over 25 lbs, it was called a Field Spaniel. Problems existed with the weight designations, so it was decided that type should be considered more important than weight. The Spaniel Club, which was formed in 1885, created Breed Standards for each spaniel type. The Kennel Club had separated the different types of spaniels in the Stud Book by 1893. In America, after World War I, the English Cocker type was less favored than the American cocker type which was forming. The American type was smaller and more elegant. The two Cocker Spaniels were shown together, competing against one another, until 1936 when the English Cocker received status as a variety. Pedigree research began in order to separate the English Cocker from the American Cocker. The English Cocker Spaniel Club of America pledged not to interbreed the two types. The American Kennel Club granted a separate breed designation for the English Cocker Spaniel in 1946. In the 1960s the American Cocker Spaniel gained popularity as a show dog in the United Kingdom and qualified for its own breed classification in 1968. Although the American Cocker Spaniel has gained popularity as a companion dog in the United Kingdom, the English Cocker Spaniel remains among the most popular breeds in the United Kingdom. In the United Kingdom and much of the world, the name “Cocker Spaniel” refers to the English Cocker Spaniel, while in the United States the name “Cocker Spaniel” refers to the American Cocker Spaniel. The English Cocker Spaniel is an active, yet compact sporting dog. As a sporting dog, the English Cocker Spaniel is designed to energetically cover ground and penetrate dense cover in order to flush and retrieve game. The physical features of the English Cocker Spaniel are designed to create a capable hunting companion. The characteristics of the head include long, low set ears, a flattened skull, wide jaws, wide nostrils and medium-sized, slightly oval eyes with tight lids. The body is compact with a deep chest and a short back. The tail is docked and carried horizontally. The coat is medium long on the body and short and fine on the head. The legs are moderately angulated and the feet are round and catlike. Females are 15-16″ tall at the withers and 26-32 lbs while the males are 16-17″ at the withers and 28-34 lbs. There is a wide variety of coat colors including solids, parti-colors and roans in black, red, liver, orange or golden. Any of the colors may include tan points on the eyebrows, muzzle, throat, chest, under the tail, and feet. The most popular color is a blue roan. The English Cocker Spaniel differs from the American Cocker Spaniel in several areas. The head is shaped with a longer muzzle, flatter head, and less prominent eyes. The English Cocker Spaniel is slightly taller, heavier and more solid. The English Cocker Spaniel does not have the profusion of tummy coat and leg furnishing found on the American Cocker Spaniel. The classic temperament of the English Cocker Spaniel is that of the “Merry Cocker.” English Cocker Spaniels are friendly, affectionate, and loyal. This is most obviously displayed in the incessant tail wagging of a happy English Cocker Spaniel. They are good with children and make wonderful companion dogs. English Cocker Spaniels need daily exercise as an outlet for their energy. They make wonderful dogs for many activities including hunting, obedience, tracking, agility, fly-ball and therapy. Although English Cocker Spaniels are alert, they will not attack strangers. They are more likely to lick a burglar than to protect your home. English Cocker Spaniels are sensitive and quick learners, especially when trained with motivational methods. They do exhibit some independence when outside the home due to their hunting background but do not wander out of your eyesight. Inside the home, they stick close to you. They will watch you take a shower, share your bed, give you kisses and play a game at any moments notice. English Cocker Spaniels can live in any environment, provided they have daily exercise. Brisk walks, fetching or field work can keep an English Cocker Spaniel in excellent shape. English Cocker Spaniels need human companionship. Although they can sleep all day while you’re at work, they require lots of attention and exercise when you’re home. The medium long coat on the English Cocker Spaniel does take some care. The coat consists of long guard-hairs on the top and a soft undercoat. Grooming styles depend greatly on the purpose, coat texture, and color of the dog. For showing purposes, most coats are stripped by hand or with a stripping knife. The face and top of the ears are clipped. The feathering is cut so it does not drag on the ground and the feet are trimmed to keep the hair neat. For a hunting dog, much of the hair is removed. Field-bred dogs tend to grow less coat. Coat texture makes each dog’s grooming style different. Ask the breeder about the effect of color and coat texture on grooming. Commercial groomers can be used with caution. Some groomers are very aware of the different styles of the American and English Cocker. Some are not. Many English Cocker owners learn to groom their own dogs and find great rewards in such as undertaking. In addition to the coat, the nails should be trimmed and teeth brushed with dog toothpaste. The ears require special care. They should be cleaned weekly with a dog ear cleaning solution. The English Cocker Spaniel is a generally healthy breed. The most common problems are Progressive Retinal Atrophy (PRA), Canine Hip Dysplasia and Kidney Disease. For PRA and Canine Hip Dysplasia, tests can be administered that will show signs of the diseases before clinical signs appear; therefore all dogs that are bred should be tested for these diseases. Dogs which have been tested for PRA will have a CERF clearance number and dogs tested for Canine Hip Dysplasia will have an OFA clearance number assigned to them. A dog must be at least two years old before OFA will certify it free of Hip Dysplasia, and its eyes should be checked annually (as some eye problems do not appear until later in life). These tests have allowed breeders to breed from the most sound and healthy dogs. 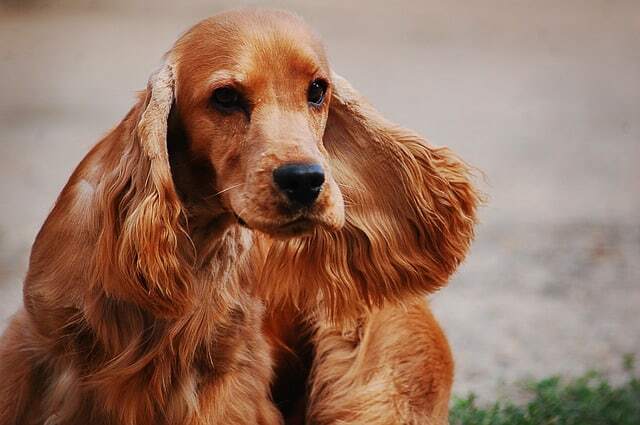 Some incidence of congenital deafness has been reported in the English Cocker Spaniel. The BAER test is starting to be performed by breeders to determine if a dog is deaf before breeding.